HR siku Cartoon Exhibit. 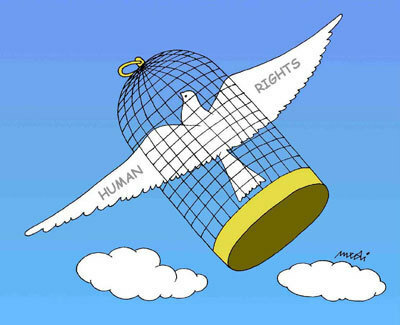 These thought-provoking cartoons illustrate the meaning of the Universal Declaration of Human Rights and conveys the importance of upholding the human rights and fundamental freedoms set forth in its thirty articles.. Wallpaper and background images in the Human Rights club tagged: international human rights day united nations cartoon exhibit dove illustration december 2008. Human Rights nukuu - Martin Luther King Jr.
What does tomorrow hold for them? human rights - it includes wewe too. This collection of 69 thought-provoking cartoons, 22 of which are displayed above, illustrates the meaning of the Universal Declaration of Human Rights and conveys the importance of upholding the human rights and fundamental freedoms set forth in its thirty articles. The cartoons have been contributed by leading cartoonists from more than 30 countries in all regions of the world. Some of the cartoons displayed here were shown previously at an exhibit in Vienna, Austria, on the occasion of the World Conference on Human Rights, in 1993, while others have been created specifically for this exhibit. This exhibit is co-sponsored by the UN Department of Public Information and the Office of the High Commissioner for Human Rights. The exhibit was on display at UN Headquarters between 10 December 2007 and 17 January 2008 and travelled to Belgium, France, Austria and Switzerland in 2008. The exhibition curator, Jerry Robinson, is the founding President of CartoonArts International (CAI). He is an award-winning political cartoonist, comics historian and pioneer Batman artist who created the archvillain, the Joker. Robinson, the recipient of the National Cartoonists Society’s Lifetime Achievement Award, is a past president of both the NCS and the Association of American Editorial Cartoonists, the only person so honored by his peers. Jerry Robinson’s son Jens, Editor of CAI, assembled the cartoons for this exhibition from more than 30 countries. Artists represented by CAI have won three Pulitzer Prizes and many other major political cartooning honors around the world. Previously, CartoonArts International produced exhibitions for United Nations conferences in Rio de Janeiro (Earth Summit), Vienna (Human Rights) and Cairo (Population and Development). CAI cartoons are searchable by topic and updated daily on www.cartoons.nytimages.com.